It's a summer afternoon, and I'm reading the latest debate about narrow vs. systemic charitable interventions. Scratching a mosquito bite, I'm reminded of a public health intervention that took place in my own country. When my grandparents were growing up, the American South was still plagued by malaria (or ague, as it was often called.) And what was the effect of the disease? The disease had been lessening over the late 19th and early 20th centuries due to better housing (glass and screens for windows) and the use of quinine. But in the 1940s, the government took matters into its own hands. During World War II, troops were succumbing to malaria on bases in the Southern US. The Office of Malaria Control in War Areas was founded in 1942 to protect the areas around military bases. After the war it became the Centers for Disease Control (the CDC) and took on the task of eliminating the disease from the entire nation. By 1951, the disease was eradicated from the United States. 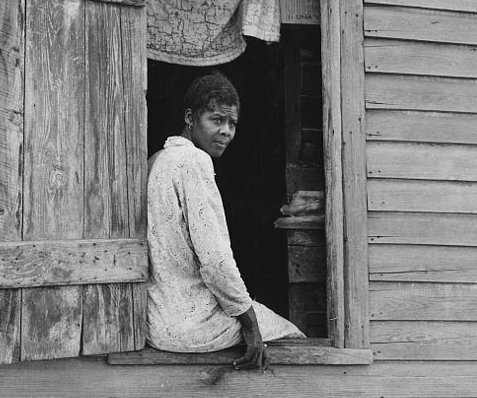 Woman in rural Georgia, 1941. Note the wooden shutter - no glass or screen. This is the type of intervention that I've often heard criticized for its narrow focus. I've heard single-issue medical interventions called "one-trick ponies", "short-sighted", "kicking the can down the road." And to be sure, the eradication of malaria in the US was a top-down intervention carried out by a government agency without much community involvement. There was not an attempt to change the social and economic conditions that prevented people from buying their own windowscreens and DDT. It just dealt with actual disease transmission. Instead of narrowly-focused efforts, proponents of broad social change advocate "lasting solutions," "systemic change," "a new operating system." Which is great when it happens. But if public health interventions are difficult to carry off well, systemic change is even harder. And yet it does happen. Interestingly enough, the Civil Rights movement sprang up in the South just as malaria was ending. The newly-formed CDC, located in Atlanta to be near the most malarial areas, declared the disease eliminated from the United States in 1951. That same year Martin Luther King, Jr. graduated from seminary. American blacks still bore the burdens of political disenfranchisement, inadequate education, poor access to health services, violence, and daily acts of hate and humiliation. But they no longer ran the risk of illness or death with every mosquito bite. Obviously there was a lot more to the Civil Rights movement than a lack of malaria. But it was one of the factors that helped. How likely is someone with “body aches, headache and nausea, general weakness, and prostration” to make it to the polls, to school, or to work? How likely are they to march on Washington? It's easier to dream big from behind a windowscreen. Easier when you're not hungry. When you're not sick. When you're not weakened from parasites and malnutrition. And for those of us who would love to see systemic change, the "one-trick ponies" may be a good way forward. Good points. I guess what bothers me is that the "narrow vs. systemic" debate keeps being presented as an either/or choice, when it should be obvious that both approaches are needed. The importance of context can be illustrated that while eradicating malaria could help make it possible for the next Martin Luther King to survive and rise to a position of influence, it is equally likely to help make it possible for the next Idi Amin to survive and rise to a position of influence. Context plays a big role in determining which of those individuals is likely to end up succeeding. If woodchucks are destroying your vegetable garden, you can dig a trench and build a fence to keep them out. Has that saved your vegetables? Not necessarily: it has only saved them from being eaten by woodchucks. If you don't weed the garden, water it, and provide adequate nutrients, most of your vegetables will die before harvest time. We need narrowly focused interventions but we also need to help developing countries tackle larger systemic problems that improve the context in which the lives we save are lived. Maybe the answer is a division of labor: governments and large foundations could take on the higher-risk systemic interventions, while individual donors could complement those efforts by giving to effective, more narrowly focused charities. But it's clear that both approaches are needed. Attacking individual stressors in piecemeal fashion can certainly improve the context in which lives are lived, improving resilience and removing barriers to progress. But it's only part of the equation. That's true. "Not having malaria" is a pretty low baseline, and I value it mostly in that it allows people to do pursue/enjoy other things. But I have very little idea of how to encourage or fund social flourishing compared to the basics. So I plan to continue funding the basics, and hope that local people will work on things like government accountability that, as a foreigner, I don't have a particularly good way to influence. I agree that given our current level of information on effectiveness, funding the basics makes sense. But somebody has to also be paying attention to the other things: not just "government accountability" but larger systemic issues such as economic and environmental sustainability, or building resilience to climate change and other stressors that could erase decades of development gains. These are issues that many developing countries cannot address on their own, mainly because they lack the financial and technical resources. They are also issues that are unlikely to be on the radar screens of most "effective altruists," precisely because their effectiveness cannot yet be evaluated. Many of these interventions have a higher risk of failure than tested and verified interventions such as bed nets. But someone has to take these risks with their donations, otherwise we will only be supporting short-term interventions whose effectiveness can be verified today. Lots of short-term results together can lead to long-term change, but some important problems require sustained efforts whose effectiveness may not be testable until decades from now. Right now, for example, aid agencies are working in Africa and Latin America to help farmers adapt to climate change by implementing water harvesting and storage techniques, providing index insurance (in which farmers get payouts based on a drought index or other measurable climate index exceeding a threshold), and testing new crop varieties. We won't know for sure how effective those efforts will be until a few decades from now, when climate change is projected to be much more severe and extensive than what we're experiencing now. If we wait until those interventions can be proven effective, it'll be too late. So all I'm saying is that we need some donors who are willing to take the risk of funding longer-term efforts toward systemic changes, as well as donors who can fund the low-risk verified basics. It's not an either/or issue. For me, this IS an either/or issue. I donate a limited amount of money. Every dollar that I send to one cause is a dollar that I can't send to something else. I have to figure out which is the best intervention to fund, whether that's index insurance or water harvesting or bed nets or something completely different. I agree that it would be good we had enough "donors who are willing to take the risk of funding longer-term efforts toward systemic changes, as well as donors who can fund the low-risk verified basics", but that doesn't help me decide which category I, personally, should be in. Ben: I completely understand your point of view, and used to share it. But now it feels too much like sticking my head in the sand, and it even feels a bit selfish: "I want MY donations to do the most possible good, so I'm going to give only to charities whose effectiveness has been verified." Imagine a world in which all donors were effective altruists. We'd avoid millions of cases of malaria and schistosomiasis, and help the poorest families in Kenya rise out of abject poverty. And yet is that a victory if the people whose lives we've "saved" have no way to defend themselves against other current stressors such as drought, lack of access to safe drinking water, or malnutrition? Now imagine a world in which all donors give to charities working on long-term systemic issues. Millions of people would die today because nobody's paying attention to immediate needs. Clearly, either extreme has opportunity costs. So either we need a division of labor (in which some donors give to charities working on "the basics" and other donors give to charities working on systemic change) or else donors should take a portfolio approach, splitting their donations between the two types of charities. I take the latter approach myself: The bulk of my donations go to the Against Malaria Foundation, one of GiveWell's recommended charities. But a portion goes to other charities (currently Oxfam in my case, though I'm researching others), that work on longer-term development projects. This increases the risk that my donations are not being put to their most effective use, because longer-term projects have a higher risk of failure and their effectiveness cannot be verified today. But if those longer-term interventions are successful, my donations could ultimately do much more good than if I'd donated only to charities working on the basics. I'm taking a risk, and perhaps its not a "rational" risk, but I feel it's an important risk to take because to ignore long-term systemic issues amounts to sticking my head in the sand. I'm also effectively taking money away from people who could use it today--buying fewer bed nets in my case --and putting it toward projects that might or might not save many times more lives in the future. That's a risk too, and I don't take it lightly. But to me it feels like the right thing to do. When I said "selfish" up above, I really meant "donor-centric." Once you learn that some charities are vastly more effective than others, you naturally want your donations to go to the most effective charities. You want your donations to do the most good. And that naturally leads to GiveWell and its current approach to evaluating effectiveness. But now let's turn it around and look at it from the point of view of the people we're trying to help: the poorest of the poor, the roughly 1.1 billion people living on less than $1.25/day. What are their most pressing needs? Food, safe drinking water, shelter, clothing, education, and access to health care. Apart from GiveDirectly, which currently operates only in Kenya, none of the GiveWell-approved charities address any of these needs directly. That doesn't mean the GiveWell-approved charities aren't effective: they most definitely are, and they most definitely are saving lives. But if nobody supports the charities working to address those other problems, are we really best serving the world's poor? Maybe the way to think of it is to strike a balance between donor-centric and needs-centric giving. I don't think it's enough to say that we know that "other people" will support charities working on systemic problems; that's the bystander effect in action. I recognize that it's hard to determine which charities to support if we want to support long-term systemic change; I think GiveWell Labs is working on those kinds of analyses now and hopefully we'll have some useful guidance in the not too distant future. I certainly don't think we should dismiss all interventions that haven't been rigorously proven at the level of AMF—sorry if I implied otherwise. I try to donate so that each dollar I give has the largest possible impact in expectation. GiveWell-style analysis and recommendations are a huge plus when I try to evaluate that, but it's not the only consideration, and lately I've been putting serious thought into switching to one of a small pool of longer-term interventions. As you point out, that would be a risk—but risks can be rational. If someone offers you a lottery ticket that costs $20 and has a 10% chance of winning $5000, then it's rational to buy it because the expected value is $500. My disagreement is about the wisdom of splitting up your donations. You're completely right that “if nobody supports the charities working to address those other problems,” that would be a disaster. But other people are supporting a huge range of charities, and my donations will do little or nothing to change that, so I don't understand why that should play any role in my choice. If all—or even most—donors were taking effectiveness into account in their cause selection, we could run into coordination problems. I would dearly love to have that problem, but right now, it's manageable. I basically just have to consider “is there room for more funding” when I compare, say, bednets to vaccinations. I completely agree with this. The world that exists today is the “division of labor” world. Given that, I think taking a portfolio approach would lower my impact. Ben, thanks -- great points and very well put. You're right that we live in a "division of labor" world, this is the reality. My views are probably colored by the fact that I work in the field of climate change (both adaptation and mitigation) so I tend to take a long view of things and focus on the high-probability risks lying ahead for vulnerable populations. It creates a particular cognitive dissonance for me to give all my donations to shorter-term interventions, hence my willingness to risk reducing my impact by using the portfolio approach. I used to donate to Oxfam, and I think some of their systemic-change type projects are doing good things that I want funded. Luckily, lots of people have heard of Oxfam, and worldwide they get a billion dollars annually. (Source: p. 48 of http://www.oxfam.org/sites/www.oxfam.org/files/oxfam-annual-report-2011-2012.pdf) Whereas AMF has a budget of $4 million. If there comes a day when all donors, or even a lot more donors, are thinking in terms of effectiveness and want to donate to GiveWell-style charities, yes, I think we'd have to branch out from the really provable interventions and fund some riskier ones as well. I hope I see that day. Me too, although I still have this feeling that "effectiveness" is a donor-centric way to look at it. You and I want our donations to do the maximum good. And they do when we donate to charities like AMF. But the systemic issues are "all hands on deck" problems: each individual contribution is a drop in the bucket and our donations to those efforts have a far smaller incremental effect. But in a way it's like voting: my vote in a national election has an almost unmeasurably small impact and yet if millions of people vote together it can bring about change. I'm willing to reduce my personal effectiveness by dedicating a (relatively small) portion of my donations to those big systemic problems because I feel that if everyone contributes, even a little, together the impact might make a difference.